Wood Panels: Blast Off or Blown Up? Blast Off or Blown Up? This was a pretty challenging piece and I'm going to try not to to tell you what it is about... that's for you to decide. I was just trying to suggest something, to inspire thought and imagination and to that end I think it works. 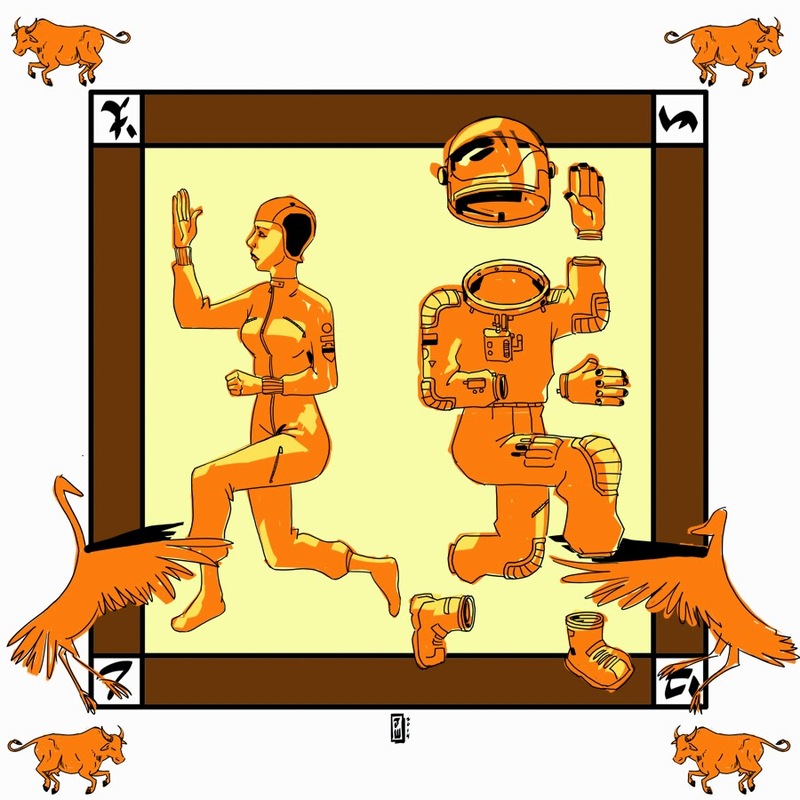 I had an image in mind - a spaceman, a sacred cow, birds and that's what I drew (top drawing far left marked with a "1"). The symbols and the odd shape behind all of them were details that just happened. I knew from the outset that the sketchbook (yes, the sketchbook told me to do it) needed, nay, wanted (DEMANDED) a bold, bright (ORANGE) page of ink. What could I do?! I knew I was going to wreck the drawing, but I had to do it. I also knew from the outset that this drawing was going to be put here, so it was going to have to be worked over and thus rough drawing "2". This is closer to what I wanted and looks to my eye like a plastic sheet of model parts that you punch out and glue together to make a toy model, or a laying out of all the things an astronaut might need. You didn't know every astronaut needs a sacred cow?! Ah, now we're getting to where I was pointing, to space and hope and absolute bowel loosening terror and what a culture might need if they venture out of our solar system, into... I thought I said I wasn't going to tell you what it's about. Right. Sorry. So we get to drawing "3". Clean? Check. Visually clear? Mmmm... not so much. Suggestive of that reaching, yearning?! Ah... no. Not to my eye. In fact it's just more confusing. I left it for a few days, asked Christine about it a few times, and thought about it some more. Part of the problem is that I didn't have much time to spend on the drawing and that feeling that I wanted to inspire was going to require too much work and time and I wasn't sure I'd even be able to convey it. Below is how I left the drawing. If you just saw this drawing, perhaps you'd feel my intent, but perhaps now that you've read all this, you see what's lacking! Tell you what, forget I said anything! It could make a good bumper sticker, or stamp or tattoo on some square shaped man's back. it sure inspires thought. Here's my theory: The whole thing, plus the stance and side view of the woman's face, remind me of Egyptian or some other ancient representation, maybe for a wall. That's the ancient past. Well, the astronaut and suit are present or future. To make it the equivalent of looking at ancient art, this would have to be a piece of distant future art, maybe celebrating the early space movement, which would be the beginning of that civilization. Since she is out ofher suit and floating, then the square must represent the enclosure of the space ship. That explains why the suit is partially out of the square. It is for excursions into space. The bulls at the bottom represent powerful movement into the ship from the bottom, or lifting power. The two birds represent the act of taking off into flight. The outward facing bulls at the top represent powerful movement out at the top, (into outer space). The writing in the corners, even though they look real, are then probably fanciful writing of your own invention representing the writing of the future civilization. However, trying to imagine the birds and bulls as symbols of this future technological civilization is very difficult. More likely the drawing is from a closer-to-the-present near-future, in which human civilization has somehow amalgamated nature and the earth ecosystem with technological development, so that the development no longer is destructive. Then the diagram shows the place of space travel as a part of nature. Okay, there's my stab at it. I would be interested in yours, and especially what do the corner symbols represent and in what language. In this theory, the drawing is not from a near future, in which human civilization has somehow amalgamated nature and the earth ecosystem with technological development, so that the development no longer is destructive. No, it's from the artist's own mind, in which this near future is already contained and alive in the present. The diagram is an outward symbol (just as so much of dream life is represented by complex visual symbols) of that world which is alive right now in your mind. Now that I've read your notes from the making of the drawing, I can see some of the ideas that are on the borderland of conscious and unconscious. For instance, the bull to you is a sacred cow. Yes, Sacred, definitely a big symbol for an unconscious mind. Although what you actually drew emphasized the charging, powerful aspect that you consciously wanted in there. ("I was pointing to space and hope and absolute bowel loosening terror and what a culture might need if they venture out of our solar system..." So the bull was your conscious representation of the terror of the void of space, not just of the power of the space ship. Nevertheless, between the four of us, we have a pretty good story going here. Yes, I totally see what you were intending. I can see modern hieroglyphs of Man's hope and message as it ventures out into space. Sort of like an engraved plaque, put on a deep space probe, just in case it's intercepted by alien intelligence. Yep, see all that. But my original, instant interpretation was something very different. And sort of in keeping with your sheet of model parts. My first thought was that this was a sort of butchers chart for preparing astronauts. You have poultry and you have beef and -- you have an astronaut. First, remove helmet. Then remove gloves. Remove suit to get to meat. Sorry. Not pretty, but that's what I saw at first glance. By the way, I like your first three illustrations much more than the final one. It's somehow too sanitized. I like the rawness of the first one. I like the butcher's diagram of cuts idea. That's pretty funny. All you need then is a Predator looking over the diagram with a nasty looking knife in hand! I'll keep the butcher's diagram idea in mind. And about your preference for the first drawing! You crack me up and make me want to cry at the same time! ME: Is it never good enough?! YOU: Sure, it was perfect when you thought it was junk, couldn't you tell? ME: But how could I tell it was perfect when I thought it was junk? I didn't stop to think that my comment could be a bit hurtful. Sorry, I didn't mean it to be. I guess I have a thing for roughs. Not just yours but mine and everybody else's as well. There's just a kind of dynamism to a drawing where you're hurrying and not worrying about being neat. You're not an idiot of any size or description and I didn't take your comment in any hurtful way. I agree roughs can be excellent and are often much more lively than the finished version. I ink my drawings in an effort to make them clear and visible, but often would much rather leave it in the blue or purple pencil I use most often which isn't so clear or visible after being scanned. I need to keep working on the inking to get it rougher, looser, more lively, also also to risk wrecking my drawings. If I'm too precious about them, they'll get really boring and I'll be too afraid to do any sort of drawing. I have to risk making ugly drawings. One thing that I do like about the inking in drawing "1" was the way the orange blended with the black (you can see it around the bull's neck), so the orange got darker here and there and helped add a new tone.